Day 72 – What an AWESOME day! We started out the day serving others in Three Rivers with our peeps from Riverside Church serving others – our group was at a BP gas station washing windshields and pumping gas. Michael and Sami also threw away people’s car trash for them. After one hour, Sami and I headed over to Skidmore Park to pick up the trash festival goers threw all over the ground. Then back to the church for a wienie roast. Mmmmm! We all then walked to the main drag to take a look at the slick autos brought in for the car show. Zowee! What a lot of fabulous rebuilt, restored and shiny shiny cars! I had a heck of a time stopping myself from shooting every single one of them! 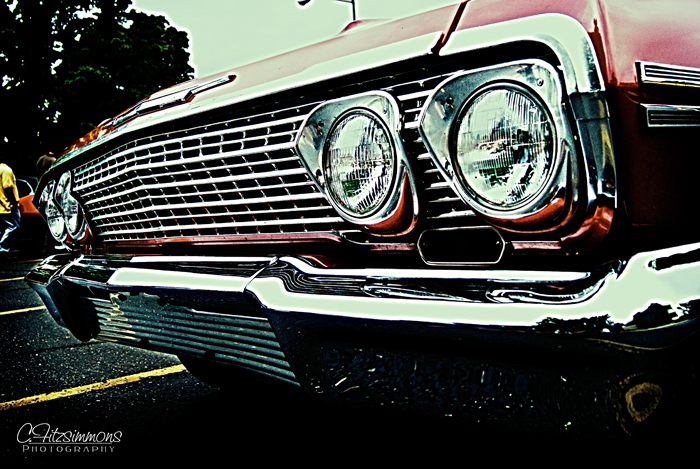 I took a vote at my facebook page for the shot of the day and the 1962 Impala was the choice! Here is a slide show of the rest of my shots.